The Great Anglo-Francais White and Black Hound (Grand Anglo-Francais Blanc et Noir) originated in France. 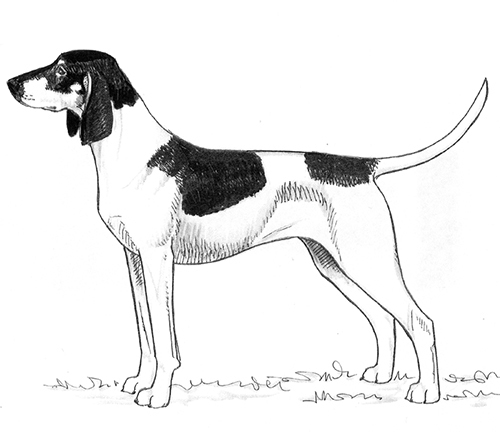 The Great Anglo-Francais White and Black Hound was recognized by the United Kennel Club January 20, 1996. A rather powerful dog, with strong bone structure. The head is strong and rather short, with parallel planes. The skull is fairly flat, with no prominence of occiput. The superciliary arches are prominent, and the stop is well marked. Slightly longer than the skull, with well developed, square lips. The Great Anglo-Francais White and Black Hound has a complete set of evenly spaced, white teeth meeting in a scissors bite. Black, and somewhat raised above the bridge of the nose. Rather deep set, and brown in color. Set on at eye level, broad and rather flat, twisting in the middle and tapering to a point. Medium in length. The shoulders are long and well muscled. The chest is broad and deep. The ribs are moderately sprung. The back is straight and firm. The loin is broad, straight and rather short and the croup is slanting, with prominent hip bones. The flanks are well filled. The thighs are muscular, without being fleshy. The hocks are strong, close to the ground, and slightly bent. Strong at the root, tapering to a slender point. Carried straight. White and black, with a solid blanket or broken black patches. Black or blue ticking or roaning. Tan ticking is allowed on the legs. There are pale tan markings on the head and under the tail. Frequently there is a tan ‘roebuck’ marking on the thigh. Fault: Tan markings that are too bright. Height at the withers for males is 25.5 to 28.5 inches. For females, it is 24.5 to 26.5 inches.